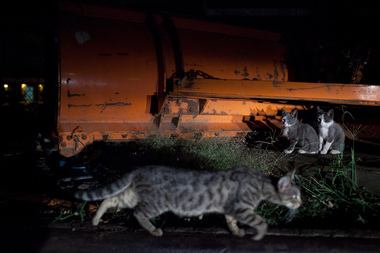 Joe Tortora waits as feral cats eat and groom themselves near one of his colonies. SUNSET PARK — On a chilly night just past sunset, retired sanitation worker Joe Tortora pulled up to the Brooklyn waterfront in a shiny dark Honda, the trunk and back seat packed with cases of cat food. Though gruff and no-nonsense, the Bay Ridge native's tough exterior is offset by the crowd of felines that swarm him as he arrives. The 62-year-old Tortora has been feeding the cats in two colonies near a Department of Sanitation depot on 51st Street for six years, ever since he was stationed there as a security guard while on light duty because of an injury. As he sat in his car at night, he’d watch Corinne Farrell, a mother of three who works at an environmental compliance company in a building on the shoreline, leave her office and feed the several dozen cats that had taken up residence nearby. 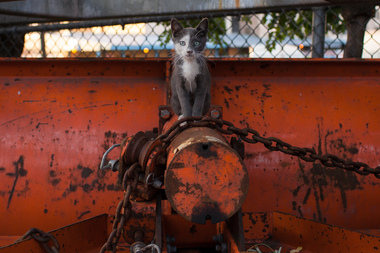 Thomas, a feral kitten, atop a snow plow in Sunset Park. With the help of the feral felines group Neighborhood Cats, he and Farrell, who has taken home six of the colony cats to live with her, trapped more than 60 felines, getting them spayed and neutered before returning them. During Hurricane Sandy, they lost 11 cats when water overran the area, and now, they provide food daily to several dozen cats year-round, building them straw-stuffed shelters in the winter to protect them from the frigid wind coming off the harbor. Tortora has the unofficial blessing of his former employers. When Richard Ferraro, a general superintendent at the Department of Sanitation, was based there about seven years ago, he adopted a calico kitten that had been one of Tortora’s charges. An added benefit, Ferraro acknowledged, was the lack of rodents around the facility because of the presence of the cats. Tortora and Farrell go through about 28 cans of food a day, at a cost of about 50 cents a can. Tortora estimates that he spent $11,000 on the cat care and feeding last year. Tortora and Farrell this week set up a GoFundMe page to help defray the costs of taking care of the felines through the winter. "In order to get us through until the spring, this $2,500 would help greatly towards food and some small medical bills if the need arises," they state on their Joe & Corinne's Shorefront Rescue page. At one of the Sunset Park feral cat colonies. The site also features some of the images of photographer Elijah Hurwitz, who has been documenting the cat colonies of Sunset Park. They considered trying to get 501(c)3 status, but the paperwork is daunting and they need a veterinary affiliation to get approved. In the past, funds were sometimes secured through local organizations to help defray the costs of spaying and neutering. And last year, the governor vetoed a bill that would have provided funding for trap-neuter-release programs. So for now, as the temperatures fall and the cats need additional food to bulk up to survive the winter, they’ll keep feeding the cats on their own dime, bringing cans and water daily. To make additional money, Tortora has started a small dog-walking service, traveling from Bay Ridge to the Upper West Side.